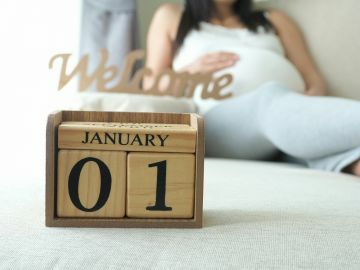 If you find yourself making the same promises year after year, we've got you covered: These pregnancy-specific commitments will make you actually want to stick to your New Year's resolutions. If you're in the business of making New Year's resolutions, you've probably vowed to hit the gym more often, get organized, or spend less money at least once or twice—but if you're expecting when January 1st rolls around, we have a challenge for you: This year, why not make a resolution that's more pleasurable than ambitious? Pregnancy is, inherently, a very selfless time in a woman's life. You spend most of your time worrying about your baby's safety. You endure morning sickness and pokes from the doctor and swollen feet all for the sake of your little one. You give up WINE, for crying out loud. And while all these things are so important (and totally worth it! ), it's also essential to keep this ultrasimple two-word mantra in mind every now and then. Are you ready for it? Here it is: Treat yourself. You both need and deserve to remind yourself of the importance of self-care. So why not make a resolution to do something for you this year? We encourage you to make one (or more...) of these resolutions for the upcoming year. You've earned it, mama-to-be. 1. I will get pampered. Whether it's checking yourself into a spa for a luxurious prenatal massage, splurging on a blowout before date night or even just throwing on a face mask and spending a few hours lounging in your bathrobe, you deserve some pampering. Make it a one-time thing or vow to do this regularly—either way, some pampering should definitely be in your future. 2. I will NOT Google every single pregnancy symptom. Now, we would never suggest you let a major symptom go unchecked, but do you really need to investigate the cause of that random chin hair that sprouted? Probably not. All these Internet searches will do is lead you down a path of paranoia....and trust us, that's so not what you need this year. 3. I will walk X miles a week. So, as much as we believe you need to #treatyourself during pregnancy, a big part of self-love involves keeping your body as healthy as possible. You know how important it is to exercise regularly during pregnancy, and walking is a pretty fantastic way to reap those health benefits without killing yourself at the gym. Vow to play a fun podcast and get a certain number of miles under your feet every week to take full advantage of this. 4. I will treat myself to something nice. You'll spend most of your pregnancy buying goodies for your baby—but take at least one opportunity to get yourself something special, too. You can treat yourself to a bump-flattering dress, a cozy pair of pajamas or some great maternity jeans—the point is, it should be something that's just for you. 5. I will try a fun new exercise class. You know you need to log regular workouts—but that doesn't mean you need to be a slave to the treadmill. Step into a fun, trendy class (make sure to get the go-ahead from your doctor first!) and remind yourself that staying healthy can be enjoyable. 6. I will not pressure myself to lose the baby weight right away. This one is self-explanatory, no? Don't push to lose the baby weight—as long as you're taking care of yourself by trying to eat healthier, get active, and get as much rest as possible, you're doing exactly what you should be doing.